Author James Sudakow explains why corporate America uses silly buzzwords. You hear it in offices everywhere: “the elephant in the room,” “when the rubber hits the road” and talking “at the 20,000-foot level.” These corporate buzzwords are so common that most people don’t register discordance when they hear it. But not James Sudakow, a consultant who noticed the laborious way people talk and realized it can be a problem if not everyone understands the metaphor. 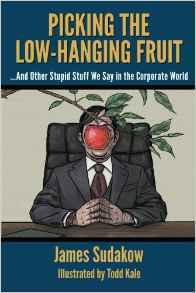 Sudakow lists the most peculiar business buzzwords in his book, Picking the Low-Hanging Fruit … And Other Stupid Stuff We Say in the Corporate World. He is the founder and principal of CH Consulting, a boutique management and organizational effectiveness firm. He recently spoke on the Knowledge@Wharton show on SiriusXM’s Channel 111. Knowledge@Wharton: Where did you get the idea to put this book together? James Sudakow: I started my career years ago, working for one of the big four consulting firms, Deloitte Consulting, and had a great experience there. But I have to say that one of the things I could not get out of the way there was the hurling around of what I thought were really strange expressions. I remember at one point, I sat in a meeting and instead of paying attention to what I was supposed to be doing, which was probably client work, I started writing down the terms that I kept hearing thrown around. That evolved into me putting it up on my whiteboard in my office, and you could say it evolved or devolved from there. Knowledge@Wharton: But that’s part of how we live our lives and talk. It’s a hard habit to break. Sudakow: In my office at Deloitte, the entire whiteboard was filled with consulting expressions. That’s what I called them at the time. When I joined other businesses outside of consulting, I learned that they were using them, too. But it was expressions you weren’t allowed to use in my office. We had to find a way not to say “drill down” or “boil the ocean” or “open the kimono.” We had to say normal words. But you’re right, it’s a habit. And there’s a rub-off effect. It’s so common and prevalent that it’s hard for you not to do it — myself included. I don’t like corporate jargon, but I found myself using a few expressions, especially after sitting in a meeting where they were being lobbed around a lot. Then I said it. I said, “What the heck just happened?” I don’t like using these expressions, and I did it. Knowledge@Wharton: In your mind, who is the perpetrator of keeping these phrases alive? Sudakow: I think we all are. It’s one of those really interesting things. I could easily point back at my consulting friends. I have a lot of friends that are still in the consulting business, and I run a consulting firm. So you could easily do that, because there is this concept of trying to be on the leading edge or talk about new ways of saying things. One of the challenges that we have in the business world is there’s so much going on. There are so many initiatives, and they all start to blend together. I can see where someone might say, “Hey, you know what? If we say this a little bit differently, it might stand out and people will pay attention to it. I get that. There’s actually a kernel of value in there, where people are trying to speak in a way that gets people’s attention because it’s so hard to do in the business world. But I do think we’re all to blame for it. If we all sat down and said, “Let me just try to talk about this in a normal way, the way I would talk to anybody else,” we might actually be able to communicate better. That’s the irony. Knowledge@Wharton: What are a couple of your favorite phrases in this book? Sudakow: When I say favorites, these are the ones that make me have a funny expression on my face when people say them. They’re the ones that just irk me the most, but they’re kind of funny. One of the things that I don’t like is “baking into the process.” I don’t know where that came from, I don’t know who came up with it, but instead of just saying “we’ll include this person” or “we’ll include that process,” somehow we decided we were going to bake it in. That one drives me nuts. The other one that I find particularly strange is “tissue rejection.” I don’t know if you’ve heard that expression before, but it was frequently used when we were consulting, where we would be working with a client and maybe presenting a concept or an idea that might be a little bit beyond where they’re able to take it at the time. And people would say, “Are we going to get tissue rejection on this?” Basically, making an allusion to some sort of transplant and the body rejects it — kind of this crazy visual image. Both of those phrases are particularly annoying to me. Knowledge@Wharton: “Bake it into the process” was one that I had marked down. It makes me think, what are we baking at the CEO level these days? Apple pies? Knowledge@Wharton: There’s another phrase in your book that I’ll bring up: data dump. Sudakow: Yes, I remember the first time I heard this. It’s very typical on large projects, right? “Hey, we’ve got to do a data dump.” I was like, “What does that even mean?” And it’s kind of this overwhelming amount of information being thrown at people in a way that they could never possibly internalize it. So then they came up with this idea of calling it knowledge transfer, which I think was supposed to be the softer, gentler data dump. But it’s the same thing. Knowledge@Wharton: The one expression I really can’t stand anymore is, why do people have to “reach out” to each other? Why can’t we just talk to each other or email each other? Where does that come from? Sudakow: Pinging. Yes. I couldn’t help myself, when I wrote the book. It just strikes of The Hunt for Red October. I think it started with tech. That became the en vogue way of saying, “Hey, I’ll just reach out,” or “I’ll text you,” or “I’ll email you” or whatever. But pinging just got out of control. I would sit at meetings, and everybody’s like, “I’ll ping you after the meeting,” or “I’ll ping you later.” I sat in a meeting once and said, “So, you’re just going to call me? Or you’ll send me a text?” It’s a very strange expression. Knowledge@Wharton: How many of these phrases have a crossover from sports? I ask because you have “bench strength” in the book. It’s a term that is used quite often in sports, but you wouldn’t necessarily link it to business. Sudakow: Yeah, that’s a great one. It was so prevalent that it made the title of my book. I hear that every day, everywhere I go. I did some research on “low-hanging fruit,” and that one comes from back during the General Electric Work-out [program days]. I don’t know if you guys remember this stuff, under CEO Jack Welch, when they would do these [corporate bureaucracy-busting] work-outs and try to figure out in an efficient way the stuff that’s easy to get. How they got at low-hanging fruit, I have no idea. I don’t even say it because I just can’t stand the way it sounds. But I get your point. It’s so common. I just try to say, “Hey, what are the quick things we can get done?” But yeah, “low-hanging fruit” is super-prevalent. Knowledge@Wharton: I have a few that really get me going, but I think my No. 1 is when someone asks me what my bandwidth is. I’m a human, not whatever they’re asking about. I automatically react to it. Sudakow: Part of the reason that I try to get people not to use all these terms is exactly what you just said. To talk about it in these terms kind of takes away the fact that we’re humans. “What is your bandwidth?” We could just say, “How much room do you have to be able to do this? Are you available? Do you have enough to do it?” But to talk about bandwidth always feels a little strange, I agree. Knowledge@Wharton: Another one that you have in this book is “rubber meets the road.” What is it about that one that gets under your skin? Sudakow: I think that it’s just used so frequently. And you sit there in meetings, people will talk at the “20,000-foot level.” It’s used as a way of trying to get us down to the ground level of what’s going to happen. But they all sit there and say, “Hey, when the rubber hits the road, that’s when we’re really going to find these things out.” It’s just so overused I think it loses the impact that it’s trying to have. Knowledge@Wharton: You also have the “elephant in the room” phrase, and people will say “gorilla” in that one as well. Sudakow: Yeah. Then there’s the “red-headed stepchild,” the “dead moose on the table,” which is really strange. It’s not as common. You have to be really, really, really good at using corporate expressions to be throwing the “dead moose on the table” out there. That’s how we know you’re incredibly adept at it. But yeah, I even use it and I’m embarrassed every time that I do it, so now I just tell people, “Look, I’m going use a terrible expression, but we’ve got to talk about the elephant in the room.” I hate it. Sudakow: Change agent is a great one. Companies are always trying to transform and change, and they’re always trying to find these people that have now been labeled as change agents. These people that are influential, that people listen to. The concept’s really good. How do we help get people who everybody else wants to listen to, regardless of their title or level, to help make the change? But calling them a change agent always kind of gives this secret, operative visual to me. And then the “change network” is all these change agents kind of working together across this network. The whole thing kind of reeks of special ops to me. Knowledge@Wharton: It sounds like there’s a follow-up book here. Sudakow: Well it’s funny that you say that, because there were 30, 40 terms left on the table. I don’t know how I didn’t put them in, but I can’t even talk without using them, right? Now I have to air quote myself. But yeah, there’s quite a few more. Sudakow: That’s great. That one, to me, is particularly strange. Usually organizations are using this organic process to talk about internally grown. That’s what they mean. How it came to that, I don’t know. It’s a strange expression. Knowledge@Wharton: This is one of those books that I think resonates with so many people out there. You probably could take suggestions from people on Twitter or Facebook and do a whole series of these. Sudakow: Oh, absolutely. One of the ideas that we had was, “Hey, let’s put this out and see which ones we’re missing that are particularly annoying to everyone else.” There’s tons of them out there. I don’t know if you’ve been paying attention to branding campaigns, but “reimagine” and “reinvent” is really prevalent these days, to the point where I saw a motor oil the other day being advertised as “reimagined.” I was like, “Could I come home and tell my wife that I bought this motor oil because it had been re-imagined?” I mean, she’d be like, “You’ve got to get some more sleep.” It’s crazy. Ping was a utility used by network administrators before the visual web we know today. Because most of the people using bulletin boards at time were administrators, they quickly started using the word ping when inviting a response from a user who was either annoying them or had specialist knowledge. It was a convenient way of drawing the matter to a user’s attention without people thinking a problem being complained about was caused by the person named. As a veteran of both finance and marketing, this article brings back a lot of other annoying buzzwords (remember “too much on our plate” and “liaising”?). But for the defense – some of them can be very useful in making a point in very few words. Referring to “low-hanging fruit” or “trying to boil the ocean” utilizes very strong visuals that are quickly understood, rather than having to explain in detail the underlying argument. Ping is a computer command to see if you can communicate with another device. As a social equivalent, you ping someone is to see if you can get a response (e.g., are they around). LOVE this article! LOL, as they say. One point the article didn’t make, however, is that these expressions can be darned useful to the Machiavellians among us (or the merely desperate). I was a freelance copywriter for years. I’d typically get a lot of grief if I told a customer I had too much other work to meet their (often unreasonable) deadline. Tell’em I didn’t have the bandwidth, however, and they were kittens. Meow. Why buzzwords? Using simple sentences, nouns and verbs, requires thinking. Buzzwords require no thought. Only your acquiescence of groupthink. Where does “like” come into natural conversation? Finally, many graduates from the US and Canada end their sentences as though they are questions with a rising tone, even though the sentence is a closed statement. Really grating on my ears. As far as I remember “To Ping some one” came with the BBM. I think it was making a statement about the owners status rather than anything else. I remember how Blackberry was the most prized possession of businessman and senior consultants. And the BBM had this ping feature. The low hanging fruit analogy transports at least some of us in the meeting to an orchard. So although the buzzwords are great for grabbing attention of the listener ; there is an element of distraction attached to them too. “Low hanging fruit ” is dangerous. We have consultants and agencies using that expression all the time when they pitch us. It implies there are rewards, sales, cost reductions, etc., which are easily obtained by using their services. It implies we’re too stupid to have noted all that fruit just hanging there as we stroll through the ‘orchard’ of our business. Nice try. Six months in I’m usually ‘calling them on the carpet’ to explain the absence of a pile of fresh fruit on my desk.